HOW TO PREPARE INDUCTIVE SERMONS provides the means for writing inductive sermons. The inductive sermon paradigm is generally used for preaching the narratives of the Bible. When you prepare sermons, you usually prepare them deductively, inductively or a bit of both. Generally speaking, deductive sermons begin with the main preaching point followed by sub-points and incidental points; whereas, inductive sermons begin with the incidental points moving towards the main preaching point. Iin other words, in a deductive sermon, the main preaching point is at the beginning of a sermon; whereas, in an inductive sermon, the main preaching point is at the end of the sermon. There are different ways to structure an inductive sermon. However, Lowry's Loop seems to work perfectly for preaching narratives from the Scriptures. The layout of Lowry's Loop has five stages. 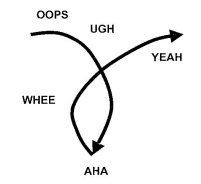 The climax of the inductive sermon is the AHA and WHEE stages. There is a narrative in Mark 14:66-72 where Peter made great boasts about his relationship with Jesus, but when it was put to the test, he completely and utterly disowned Jesus. The main preaching point of this narrative is that biblical faith is grounded in humility that leads to repentance not self-confidence that leads to superficial boasting. Using Lowry's Loop inductive paradigm to outline this narrative. Notice in point 1 that the tension is introduced, in point 2 the tension is explained, in point 3 and 4 the tension is resolved and in point 5 the tension is avoided because we now see faith from the right prospective. When you are writing an inductive sermon, you must keep in mind that a sermon has three parts: an introduction, the body and the conclusion. The introduction introduces the tension, the body explains and resolves the tension and the conclusion states how to avoid the tension. Let's write an inductive sermon from Mark 4:66-72 using the inductive outline above. Associated Press reporter Terry Anderson was held hostage in Lebanon for nearly seven years. He was chained to a wall in a filthy, spider-infested cell. He suffered through sickness. He endured mental torture. He longed for his family. He was ground down by the dull ache of incessant boredom. Through it all, he was given one book—the Bible—and he devoured it in search of words of hope. It was the Word of God that strengthened him to endure his captivity. After 2,455 mind-numbing days of cruel captivity, Andersen was finally released on December 4, 1991. Journalists clustered around and peppered him with questions. They wanted to know what his ordeal had been like. They wanted to know his plans for the future. But then one reporter called out a question that stopped Andersen in his tracks: “Can you forgive your captors?” You know, that question reverberated in his mind. “Can you forgive your captors?” You see, Andersen was a Christian and he believed in the Word of God with all his heart. God’s words were his words. He had spent so much time in God’s word that they became his words. You know, it’s tough to be a man of your word. Now, Peter was horrified at this thought. To think that he would stumble, especially when he had already confirmed that Jesus was the Christ (Mark 8:29). This utterly horrified him. Peter’s words convey that he would never be disloyal to Jesus…that he would never deny his Lord. Well, Peter’s words were put to the test that night in the high priest’s courtyard. This man who sprouted that he would rather die than deny Jesus, had now completely and utterly disown Him. And what made it so hypocritical and hideous was that he called God as a witness to this lie. What made Peter in one breath make great boasts about his stance for Christ, and yet in another breath deny Him completely and utterly? What happen to this man who declared Jesus as the Christ? In many ways, we’ve seen this happen before. We may have even done it ourselves to our shame. We’ve seen people make great boasts about their stance for Jesus, but in practice they have denied Him. We too may have made great boasts about our stance for Jesus, but in practice we have denied Him. Yes, it may be tough to be a man (or a woman) of your word. But there is more to it than that. Look at me, I’m not like the other disciples. They may fall away (or stumble), but I will never fall away. Self got in the way of Peter seeing what Jesus was trying to tell him. How many times did Peter take things into his own hands? Lord, you’ve got it all wrong. Remember, he was talking to the King of Kings and Lord of Lords. Instead of accepting what Jesus said, Peter disputed with Jesus and done things his way. Man, do we see that today. Peter’s words were not grounded in faith but in self-confidence. God had to humble Peter in a way that would change his life forever. In that moment of humility, Peter is broken. He sees himself as he really is...a sinful man in need of God’s mercy and forgiveness.It was in this moment of humility, Peter shed tears of repentance as he wept bitterly in light of his denial of Jesus (his sin). Faith grounded in humility leads to tears of repentance—seeing ourselves as we really are. Faith grounded in humility leads to confidence in God and his word not in self (no longer disputing God’s word but accepting it and obeying it). What an impact this man’s faith has had on the church of Jesus Christ!